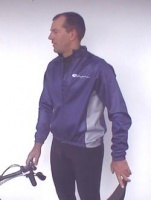 Bike clothing showed by our record sportsman Leo de Nooyer. The pants are available as bermuda, long pants and long thermo pants. The shirts are available with short and long sleeves and as a winter waist coat. Two pockets low in front, zipper along whole length. For correct size: please include body and/or inner leg length with your order. Two pockets in the front and zipper along whole lenght. For correct size: enter body and/or inner leg length in the remarks field below the address data in the shopping cart.